Since iOS devices top many gift wish-lists, a new holiday tradition can be added to your annual routine: family get-togethers, unwrapping presents, and hitting the App Store. 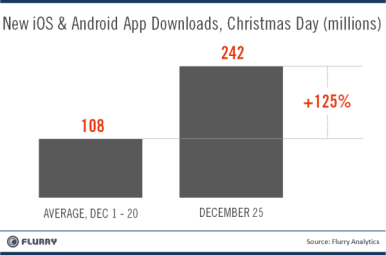 Post-holiday app downloads skyrocket as new iOS and Android devices are activated, according to data calculated by Web metrics company Flurry. In past years, Flurry found December 25—Christmas Day—to be the busiest day for app downloads, and 2011 is proving to be no different. Breakdown of app downloads by the hour, courtesy of Flurry. On December 25, 2011, 242 million apps were downloaded across both iOS and Android platforms. This is a 125-percent increase when compared to the daily app downloads averaged between December 1 and December 20, which was 108 million apps a day. Peak hours for massive app downloads are between 7 p.m. and 10 p.m., shown both on Christmas and through normal daily app download data. Daily app downloads by the millions, courtesy of Flurry. 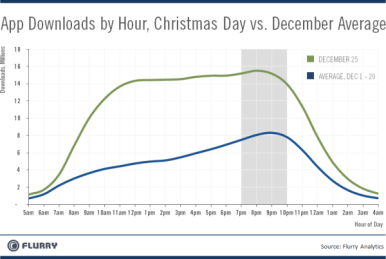 Voracious app downloads are expected to continue into the new year, based on data from the 2010 holiday season. Flurry anticipates 1 billion total downloads between December 25, 2011 and January 1, 2012.